Dimensions 0 by 6.14 by 9.25 in. Data Stewardship for Open Science: Implementing FAIR Principles has been written with the intention of making scientists, funders, and innovators in all disciplines and stages of their professional activities broadly aware of the need, complexity, and challenges associated with open science, modern science communication, and data stewardship. 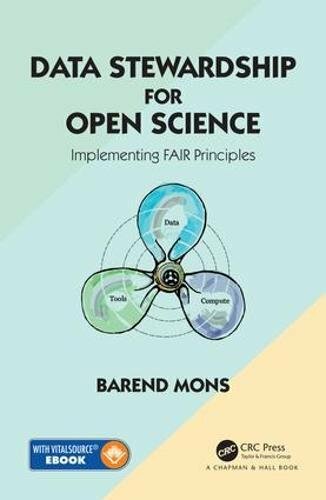 The FAIR principles are used as a guide throughout the text, and this book should leave experimentalists consciously incompetent about data stewardship and motivated to respect data stewards as representatives of a new profession, while possibly motivating others to consider a career in the field. The ebook, avalable for no additional cost when you buy the paperback, will be updated every 6 months on average (providing that significant updates are needed or avaialble). Readers will have the opportunity to contribute material towards these updates, and to develop their own data management plans, via the free Data Stewardship Wizard. About: Data Stewardship for Open Science: Implementing FAIR Principles has been written with the intention of making scientists, funders, and innovators in all disciplines and stages of their professional activities broadly aware of the need, complexity, and challenges associated with open science, modern science communication, and data stewardship.